Today’s interview is with RonTully, with Next Generation Labs. His is a name you may have heard before ifyou are in the liquid biz. Today he’ll be sharing a product that may change alot of things in the e-liquid world. Tobacco Free Nicotine: what isit? Another name for it is synthetic nicotine, but the term syntheticis not a popular one, kind of like GMO. There may be advantages to TFN:Better flavor. No aftertaste. Easier to mix with. Those are all good. But it’spricier than regular nicotine. But not enough to dissuade you and after all,you do get what you pay for. When you combine TFN with highquality ingredients, what do you get? Pretty awesome flavor. Great forconnoisseurs! The world of vape is changingand you must change with it. The key to survival is adaptation, and ourinterview today IS all about adapting- to a brand new market. Coming up soon; VAPE U III:Vape Summit. 4 days, 20 hours with 20+ of the most amazing thought leaders inthe vape space to educate and empower you. Sign up at www.vapementors.com. What do YOU want to know? Weinterviewed tens of thousands of vape professionals and asked: What keeps youup at night? What worries you the most? With hundreds of responses we drilledit down to just a few areas and then found the best people in the industry toaddress them. It’s June 23-26 and it will be FREE. That sets to the tone as we move forward and where survival of the fittest- and those willing to change- will live. We encourage all of you to pay attention since this movie is by non-vapers for non-vapers and is a powerful story that may help our cause. Coming up soon; VAPE U III: Vape Summit. 4 days, 20 hours with some of the most amazing thought leaders in the vape space to educate and empower you. We interviewed tens of thousands of vape professionals and asked: What keeps you up at night? What worries you the most? With hundreds of responses we drilled it down to just a few areas and then found the best people in the industry to address them. It’s June 23-26 and it will be FREE. “This is not chapter three of the trilogy; it may be the end of chapter one and there is much more to come.” “It ain’t over till it’s over.” Two quotes that may indicate the direction of this Brand New World of vape. The other shoe has fallen. The FDA has spoken and it means…what? The end of the world as we know it? Business as usual? Do we even know? This interview with attorney Phil Daman, a nationally recognized FDA legal authority, covers what these new regulations say and what they don’t say. Since the new regulation’s start clock officially begins on 5/10, we are proclaiming May 10 as National Vape Awareness Day. Phil will be joining us for a LIVE Q & A, and since this is time sensitive, you can visit www.vapementors.com for information. We interviewed Mike Sessoms, the founder, who offers insight into the program and why you should attend if you are a serious player in the vape space. 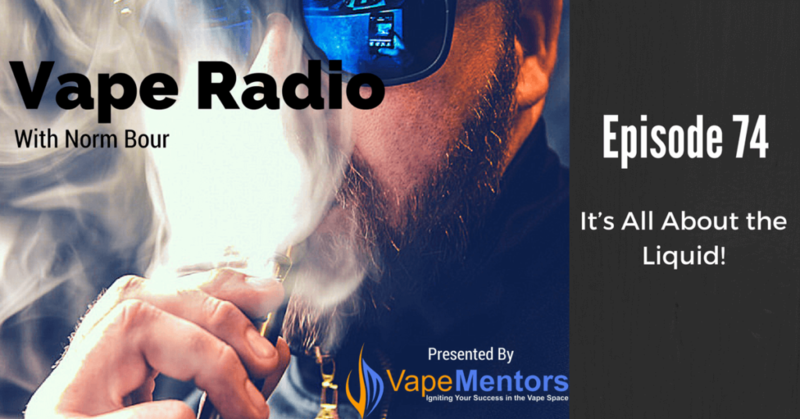 Vape Radio 74: It’s All About the Liquid! This show includes an interview with one of the largest contract manufacturers of e-liquids in the country. We discuss future regulations and how they compare to pharmacy guidelines. We will see more changes in THIS sector than any other one over the next two years. At VapeMentors we connect with amazing people and significant companies. When you hire me you get not just me, but our entire network. Today you’ll meet one of the resources, known as JSPR. They also own Council of Vapor, and if you need hardware designed, they are the Go to people. I plan to spend quite a bit of time on this liquid market in the next few months for some of these reasons, plus because I am launching a program to help vape shops double their revenue. One tool to that end is house lines of juice. I’ll be sharing that in the next show or two. In this special report, we estimate the costs to open a vape shop or a kiosk. You might be surprised at some of the numbers. Read this and do your research before you put money down on a lease. On our last show, we started a conversation with Nick(Grimm) Green, one of the most prolific and influential reviewers today. We covered so much awesome content we ended up breaking our interview into two parts. Welcome to part II. In our last show, we spoke about hardware and products that work, as well as some that don’t and Grimm shared his list of “must carry”inventory for vape shops. Be sure you catch that one along with this show here. Vape Radio 71: Vaping Super Star Grimm Green Shares Thoughts on Hardware! To say that I’m jazzed about today’s show is an understatement! At VAPE radio and VapeMentors we are proud to know some of the most amazing people that we call friends. Today you’ll be hearing from one of them.